This innovative volume builds on dialogues opened in recent years between Cuban archaeologists, whose work has long been carried out behind closed doors, and their international colleagues. The chapters included herein span a wide range of subjects across the full chronological spectrum. Most were written by emerging Cuban professionals who are breaking new ground; a few were penned by long-time leaders in the field. 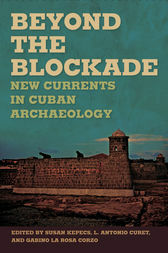 Issues addressed by the 17 contributors represented in this collection include the long-term cultural and intellectual links between Florida and Cuba, which influence shared research goals today; the limitations of theoretical frameworks for archaeology defined in the wake of the Cuban Revolution, and how to overcome them; the challenges involved in charting out the earliest human occupations on the island; the processes of Indo-Hispanic transculturation during the Colonial epoch; late pre-Colombian links between the Taínos of eastern Cuba and the rest of the Greater Antilles; and the theoretical and practical tensions between architectural restoration and the practice of scientific urban historical archaeology. Thus this volume makes a crucial contribution to the field of archaeology on many fronts, not the least of which is the sharing of information across the blockade. Susan Kepecs is an honorary fellow in the Department of Anthropology at the University of Wisconsin–Madison. L. Antonio Curet is Associate Curator in the Department of Anthropology at the FieldMuseum in Chicago. Gabino La Rosa Corzo is research archaeologist at the Centro de Antropología in Havana.